This sturdy built rack has been designed to facilitate convenient, safe and efficient stowage of drums and barrels for decanting. 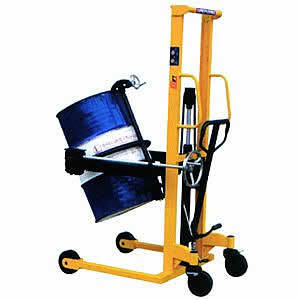 Taking the backbreaking work out of drum handling, they are indispensable in garages, warehouses and factories. A standard Lemcol 75mm nylon wheel is used for ease of replacement. now a simple matter with SPILLDOKTOR poly drum bunds. 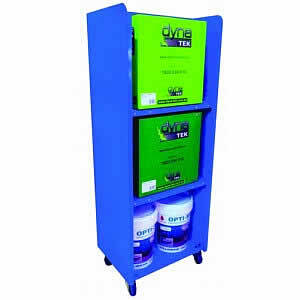 provision for fork tynes, and made from heavy duty polyethylene for durability. 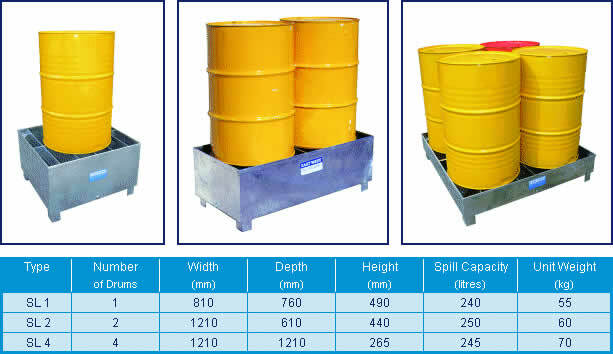 Our range of SL Spill Bins provide complete protection against damaging and costly chemical spills and are available to cater for one (1), two (2) or four (4) drums. 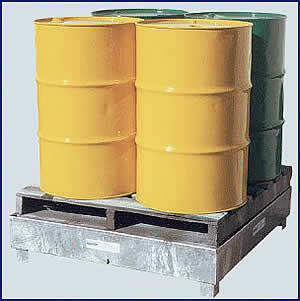 Also available to suit the 1000 litre Intermediate Bulk Containers - refer SL-IBC. Close spacing support bars allow for large or small drums up to 2000kg SWL. If required, timber pallets will fit within the raised skirt, or drums can be placed directly on the support bars. All models have a spill capacity of at least 110% containment of the largest drum in accordance with Australian Standards, being classified as "portable" units. Available in 2 drum and 4 drum and 4 drum in-line versions. These units can be connected with a simple bund to bund connector, which will increase the bund capacity. Also available is an optional ramp. 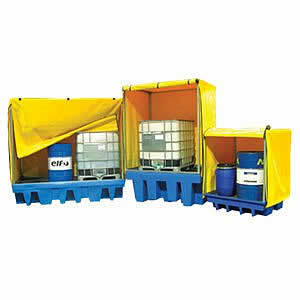 This unit can stack and decant up to 4 drums at one time, with the added assurance that a large spill can be contained. Order units separately as below. All 1000L bulk containers must be bunded to comply with regulations which means the bund must contain at least 1000 Litres. These units include a knock down galvanised steel frame (Stainless also available) which supports a heavy duty PVC cover with zipper door to the front for quick access. This unit features a unique design which makes use of the lever principle to rotate a standing drum to the horizontal postition, where a swivel wheel allows the whole unit to travel along the floor. 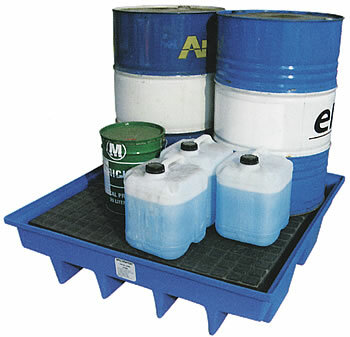 The caddy doubles as a bund, with a 230 litre capacity to contain at least one whole container, should it spill or leak. Eliminates the difficulty in reaching contents associated with wheelie bins. 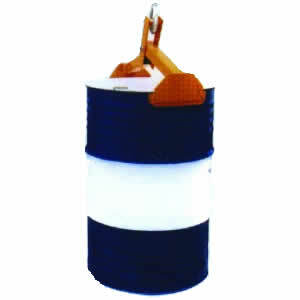 Stores 2 drums in a lockable and weatherproof polyethylene bund. Simple to access and built with stays to hold lid open. stowage of drums and barrels for decanting. A standard 75mm nylon wheel is used for ease of replacement. Plastic hand grips resist slipping when drums are being loaded or transported. Smooth Rolling and Strong, Durable Construction. 100mm Diameter Heavy Duty Castors. Moves, tilts & rotates fully loaded steel drums. 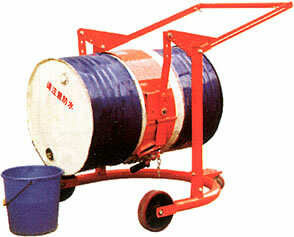 When unlocked the drum may be turned end over end to drain or empty drum. Automatic operation for picking-up and releasing 205 litre steel drums. Works with shop cranes, hoists or forklift hooks. 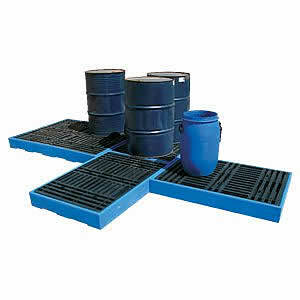 This design has been developed to hold most 15 to 25 litre drums which can be rectangle or round and of either plastic or metal. The SP15-25 requires minimal assembly and has a flat-folding option for easy storage. 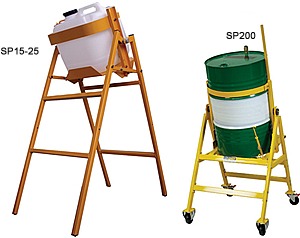 The SP200 is designed to hold 200 litre or 44 gallon metal drums which, when decanting, appear virtually weightless. 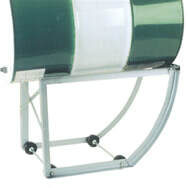 A unique system allows the metal drum to be automatically returned to the safe upright position when released. The SP200 is extremely durable; manufactured with robust welded material and a powder coated finish. The SP Multilifter can be used to load up to 500kg metal drums for a variety of lifting applications. It is designed to eliminate the need for two separate lifting devices and can be used to lift drums with and without lids. It also features a positive lock action which grips the rim of the drum for hands-free safety. 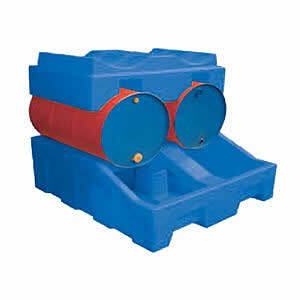 This product has been manufactured for ease of handling full 200 litre drums and hogsheads. Due to the unique design, size and relative weight makes almost no difference to the balance and efficiency of the Drum Truck. The L60 is of steel construction with strain points specially reinforced to withstand the toughest treatment. The models are offered with two types of wheels Cushion tyred wheels provide a greater capacity while having the added advantage of being puncture-proof. Pneumatic wheels are offered where greater shock absorbency is required or where operating conditions are a consideration. When stored in an upright position, the compact L60 requires only 0.3m2 of floor space.